The images that came up when I posed this question showed America, collectively, as a 56 Sojourner (Primary Figure) on a journey far from the center facing a 28 Great Transition (Heart Theme), a moment of truth when it must stand alone and reject all collective wisdom, traditional moral platitudes, cultural stereotypes and personal greed. Where America wants and needs to go was expressed as 45 Gathering the resources, material, human and spiritual for a great new project that could be of benefit to all (Relating Figure). The Lines or Voices in this reading showed us poised between two disasters, burning up our rest house and all that supports us at this moment of transition (Line 3) and burning up our nest and losing all our cattle, the place where we live and what feeds us, our reservoir of wealth (Line 6). To me, these Lines represent what happened after our last President announced the War on Terror and promised that we would “spread death and destruction to the four quarters of the world in defense of our great nation” and the military adventures that followed, adventures that have bankrupted the nation financially and morally and established a virtual police state that has siphoned America’s wealth into the pockets of what Eisenhower so aptly called the Military Industrial Complex. 25:26 Disentangling and Accumulating the Spirit portrays the process of disentangling from the cultural ghosts that haunt old tombs and institutions and nurturing the spirit of the new through contact with the ancient sources of wisdom and the oracle books. Disentangling from negative emotions: lies, deceit, disorder, mania and disequilibrium; pure, spontaneous, unplanned, unexpected, freed from confusion; an exorcism and purification from plague, miasma and the demons of the past. Heart Theme: 53 Gradual Progress to the symbolic world. To make this connection with the hidden, we have to go back to what I was talking about when I saw the Pairs and Pairing as the central Engine of Change. The oldest image of these Pairs is the Gates of Change, the Dragon/Heaven and the Dark Animal Goddess/Earth which became the well-known pair, yin and yang. But in the old myth world the two powers were directly embodied in two other words that represent stances or qualities of the will. These are the oldest words for yin and yang. They are personal processes, not abstract qualities. Da, great, calls upon you to be great and strong. It means to collect your strength, organize yourself around a central idea or purpose, impose your will and act to help and protect others. The Great Person is someone who has done this, who has acquired power and wealth. The Great People are ancestor spirits and those through whom they manifest blessings: great rulers, sages, ritual experts and diviners, people in contact with the bright spirit that offers great insight and the power to manifest it. Xiao, small, calls upon you to be flexible and supple, letting go of your sense of self-importance and yielding in a spontaneous and flexible way. The Small Person is one who must adapt to whatever crosses his path. . Traditionally, the Small People were those without lands or patrimony who had to take service with a lord and were subject to his whims and commands. They could hope to influence their situation only through adaptation and inner work. The Small Person became a Daoist byword for those who could see the small beginnings of change, unencumbered by pride and complication. In the world of Change these processes or orientations of the will are the tools of the Realizing Person, the person whose goal is use Change to act in accord with the Way and accumulate the power and virtue to become who he or she was meant to be. In later China, and in our culture, they were frozen or literalized as definitions of social classes. 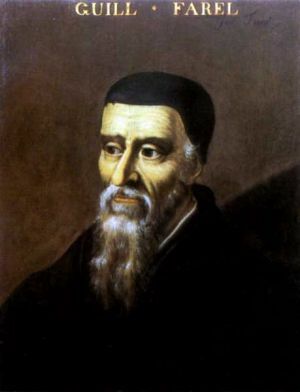 Now historians of religion and culture in America are in virtually unanimous agreement that the most significant founding images in the formation of America’s social and spiritual identity come from the work of John Calvin (1509-1564). Calvin created the patterns and thought that would dominate Western culture throughout the modern period. American culture, in particular, is thoroughly Calvinist in some form or another. He built his church on the concept that salvation was not a choice, but was rather pre-decided by God. This mean that individuals were elected for salvation by God and this Elect forms the population of the Calvinist church, “living saints” who are guaranteed salvation no matter what they do here on earth. Further, God would show his selection of the Elect by conferring the blessings of wealth and power upon them. Thus those possessing wealth and power are, by definition, God’s Elect, guaranteed eternal salvation. These are the Great People in the American definition. The Preterite or Damned from birth, on the other hand, are the Small People, locked into poverty. Nothing can or should be done to help them, for they are excluded from the community of living saints, the Elect. Calvin also insisted on the literal reading of Christian scriptures. Anything not contained explicitly and literally in these scriptures was to be rejected; on the other hand, anything that was contained explicitly and literally in these scriptures was to be followed unwaveringly. Not only should all religious belief be founded on the literal reading of Scriptures, but church organization, political organization, and society itself should be founded on this literal reading. These are precisely the “Ghosts that Haunt Old Tombs” from which America must disentangle itself in this Election Year if it is to have a hope of reconnecting to its great mandate for Change.